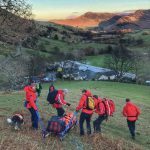 As the previous job was ending, the Team received a report that a lady had broken her ankle whilst descending from High Spy to High White Rake. Two vehicles were ready in minutes, and the Team set off to the Borrowdale Gates to access the hill. Other Team members went direct to the scene. Fortunately, the air ambulance from Blackpool was able to assist with the rescue, which would otherwise have taken another two hours. The leg was splinted, the patient given analgesia, before being carried about 400 metres to the aircraft. She was then flown to Whitehaven Hospital for treatment, and the Team returned to base for an extensive clear up.